Here is a snippet of a scaffolded handout I use to teach students how to combine like terms. 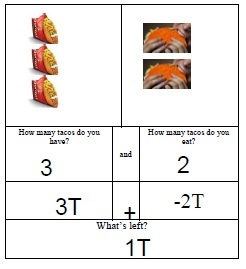 The tacos bring in prior knowledge and makes the concept more concrete. The scaffolding guides the students as to where and what to write. The full handouts are available by following the links below. I’ve included my webpage address. I don’t care about getting credit but please leave the address on there if you share these handouts. If anyone has follow up questions they know where to find me.